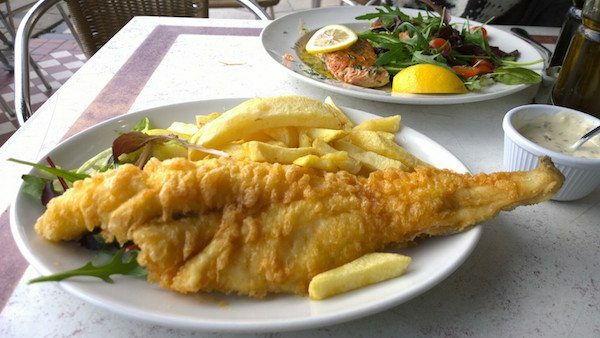 Located on the corner of Kings Road and Regency Square, The Regency Restaurant is in a prime location for locals or tourists to enjoy classic fish and chips by the beach. The Regency Restaurant has been open as a seafood restaurant since the early 1930’s and was taken over by Emilio and Roberto Savvidas from Cyprus in 1986. It serves a range of fresh, classic seafood dishes, alongside your traditional fried fish and chips. 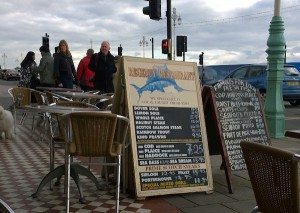 My partner and I were wandering along the seafront on a sunny Saturday, and decided to pop into the Regency Restaurant to try out their fish and chips. It was a lovely day, and the restaurant was really busy inside, so we grabbed a table out the front and I went in to ask the waiter for some menus. The restaurant is large, with wooden tables and furnishings, big windows at the front, and plenty of seating at the back too. It seemed like everyone else had the same idea as we did when we arrived, as it took awhile for me to access some menus as there were many people lining up for inside tables at the door. Once we had the menus, the wait staff were attentive and friendly and came and checked up on us shortly after to see if we wanted something to drink. I just went for a herbal tea and my partner had a soft drink, but they also have milkshakes, and a full bar with a wine list too if you feel the need! The food menu includes a range of seafood starters and then main dishes where you can choose to have potatoes, chips or salad on the side. There are shellfish dishes as well as house specialities and they have a menu for the little ones too. If you don’t want seafood, they also serve roast dinners, chicken and steaks as well! There is a sign on the door saying the won the best fish and chips in Brighton in 2013, so it must be pretty good – we were looking forward to our food. We were both pretty hungry so decided to get a couple of starters to share and then a main each. We did have to wait quite awhile for our food, but the restaurant was really busy and we were in a great spot for people watching where we were sitting so we didn’t mind. The starters arrived and they smelt and looked great. We had prawns cooked in butter and garlic and fried scampi too. 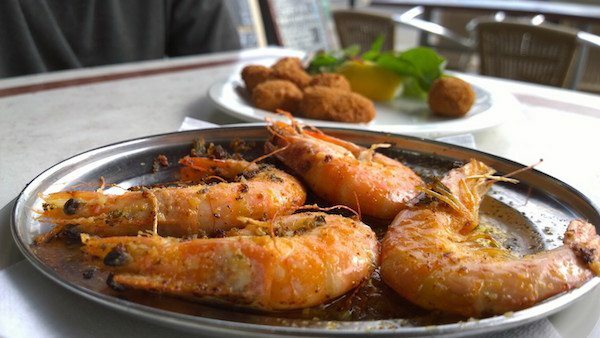 The prawns were drowning in butter, which to me is a good thing, and there was loads of garlic that was caramelised and so lovely and sweet. They were served in their shell so expect to get your fingers dirty, but the prawns inside were plump, fresh and juicy, it was a real treat. The scampi was fried until golden, with a crispy bread crumb coating and was moist and fresh tasting, it was some of the nicest fried scampi I have had. It came with a lemon wedge and small side salad and also some tartare sauce for dipping. Our plates were cleared quickly, despite it being busy and us being almost the only people sitting outside, the service was really attentive and the wait staff seemed to be on top of what they were doing. The mains took another little while longer to come out, but as I said they were busy so it was to be expected. 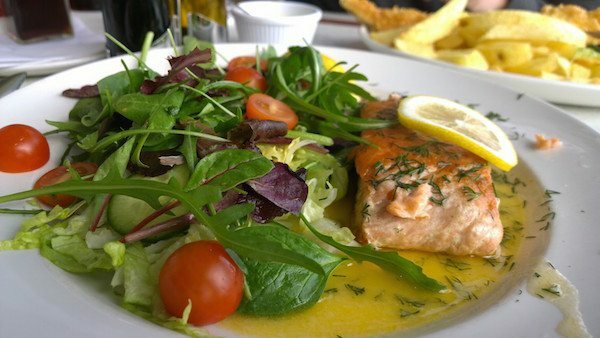 My partner ordered the battered cod with chips, and I ordered one of the house specialities – grilled salmon fillet with dill and lemon sauce and salad. As you can see from the pictures, the portions were generous, and the prices were pretty reasonable given the location and the sizes of the dishes. For fish and chips you are looking at around £7.25, so slightly more than your average takeaway chippie, and the rest of the mains around anywhere from £7 – £15 depending on the dish. The fish batter was fluffy and crunchy, and well seasoned, and the fish itself tasted really fresh, reflective of the high turnover in the restaurant. The chips looked hand cut and were chunky, they were a little undercooked for my liking, but my partner said he loved them. wouldn’t like it, but I loved it! The plate was covered in salad, just your classic, dressed salad, nothing fancy but it was all fresh. The Regency Restaurant is in a great place for trying fresh, local seafood with reasonable prices and it really has something for everyone. It’s best for enjoying a relaxed, dine in fish and chips experience, so not so good if you are looking for takeaway fish and chips to take down the beach. I really enjoyed my first experience at Regency Restaurant and I will certainly be heading back there again soon.